Lately, I’ve been feeling guilty and have poured my energy into inward reflection and searching. Although this can be detrimental if the focus remains mainly on the negative, this time of speculation has drawn my insecurities and shortcomings to the surface, enabling them to be plucked from my overly-clenched palms. The biggest flaw that has seeped out into the open is my lack of priority organization. What should be my first priority is falling somewhere around fourth place in my life’s lineup—that sweet time spent with my Savior. Some days it’s simply an afterthought or a check-off-my-checklist business transaction. So really, what was even the point? Finding time to commit 100% to my relationship with God seems about impossible. But is it really, or am I just making excuses? After a little soul-searching and schedule perusing, I have discovered the best ways for me to spend time with God. 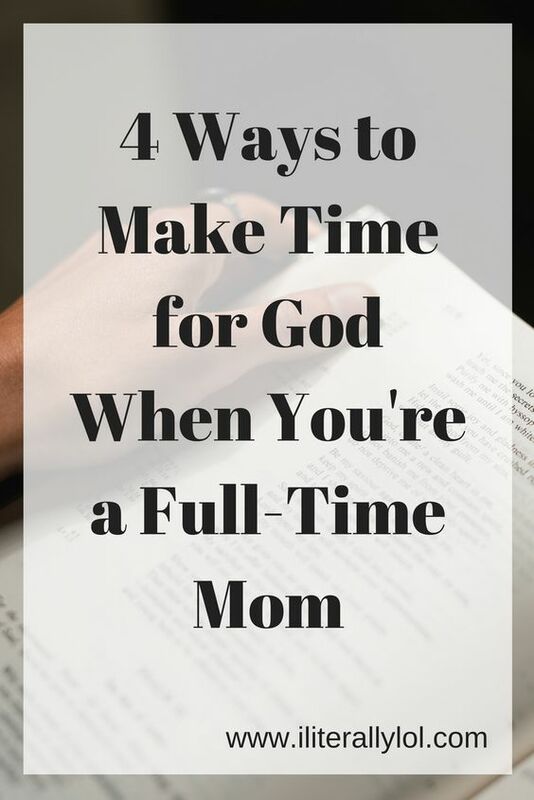 If you’re a stay-at-home mom, then this might help you too! Get out of bed thirty minutes earlier. Ladies and gents, sleep is my friend… dare I say my bestie. I committed several months ago to meet up with a friend of mine three days a week at 5:00 a.m. to work out. Yes, I might be clinically insane. But let me tell you, even though the last thing I want to do is drag my sleepy behind out of the bed at 4:40 a.m., I truly love how I feel afterward. Our workouts end at 5:30, leaving me an entire hour to myself before the kids wake up… the perfect block of time for prayer and Bible study. This time is special to me, but what about the other four days? It doesn’t always happen… which leads me to number two. Cut out one TV show a night. Netflix is my guilty pleasure. After a long day, nothing sounds more appealing than vegging on the couch with my newest Netflix series addiction. As much as I love my “me time,” I will never feel fully charged if I don’t make “me and God” time a bigger priority. God sacrificed everything for me so why not “sacrifice” a Once Upon a Time episode for Him? Missing one show so that I can spend more time with my Father makes a world of difference! Utilize your kids’ quiet play time. While my oldest two are at school, my morning consists of nonstop entertaining a two-year-old. She is on-the-go almost continuously. But I can get her to sit still for about twenty minutes, playing with Play-Doh or blocks. During these times, I sometimes grab my Bible and a book to get some study time in for the day. It’s doable and necessary on days where I’m exhausted and have busy afternoons/evenings ahead. Naptime is sometimes the best time. If you stay at home like me and your children still take naps, this might be your best option. Of course, this could mean giving up precious cleaning time. But I would rather have dirty dishes in the sink than a dirty heart. Naptime is sacred time. I need not waste it! Excuses can destroy our spiritual health if we allow them to. When we say that we don’t have time, what we really mean is we don’t want to make time. We only make time for what we see as top priorities—things that are absolutely necessary. When our priorities change, then we will find we have plenty of time for God. And trust me, that time set aside will be worth every second! These are great tips! And not just for time with God but just time alone to do something you use to love doing. ie crafting, reading, etc. I agree with Angel, these are great tips that work all around for anything you are neglecting in your life! Great post Steph! One sermon that has stuck with me most over the past few years was one about being too busy for God. I will never forget it! It was definitely a moment of conviction for me because I am always busy! Who isn’t?! And this was even before I was a mom! Anyway, the sermon ultimately said that if the Devil can’t make you bad, he’ll make you busy! So true! This post is great reminder mama! Yes! The enemy definitely tries to keep us “busy”!